Lose That Girl: RATE IT! Pinball Table, Anyone? RATE IT! Separated at Birth? HATE IT! What's that Crunch? RATE IT! Pinball Table, Anyone? Got a spare $2,000 to spend? Nah, I don't either, but if I DID, I would head straight over to this fabulous webstore, Still Life. Pricey, yes, but that's not the only green aspect to this shop -- Still Life takes gently used items, and recycles them into unique furniture with a new lease on life -- all for your home. A pinball machine morphs into a coffee table, a vintage movie theatre chair gets made over into a living room staple, while a '50s telephone becomes....a lamp?! 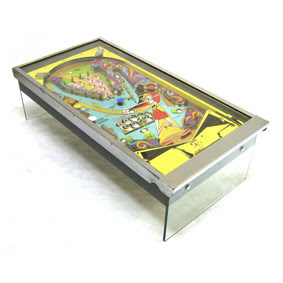 If my boyfriend had his way then we WOULD have a re-purposed pinball machine as a coffee table!! And probably some vintage car rims as end tables! Thanks for finding and sharing this "pinball table". I'll be sharing it with some "pin-heads" I know.